with national spirit at heart." 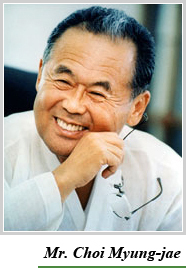 The founding of the Korean Minjok Leadership Academy was possible thanks to the sacrifices and vision of the school��s founder Mr. Choi Myung-jae. After experiencing the pain of colonization by Japan and Korean war, Mr. Choi saw that healing the nation would necessitate a new approach to education. This became his primary life goal, and involved extensive travel and observation of top schools around the world. Mr. Choi envisioned a loftier purpose for education that did not focus on personal gain, but instead emphasized selfless concepts of civic virtue. From this system, young leaders would emerge to strengthen a recovering nation. After a long period of preparation, the Korean Minjok Leadership Academy came into being in 1996. Since its foundation, KMLA has consistently attracted Korea��s brightest students. For the young and ambitious, it��s the perfect place to actively pursue ones dreams. However, the founder continues to believe that this school is only a beginning. For Korea to continue to rise and contribute to global society, the school has to firmly stand on cultural traditions, combined with a global vision. Today, The Korean Minjok Leadership Academy has evolved to become our nation��s finest example of pioneering education. While the history of the school may be short and the student body small, KMLA��s prestige and reputation resound across the globe. The dream of founder is fulfilled by the many students who have learned, and continue to learn, within the rich academic environment that is truly unique to the Korean Minjok Leadership Academy.